Illustrates the route of the South Carolina Rail Road Company. 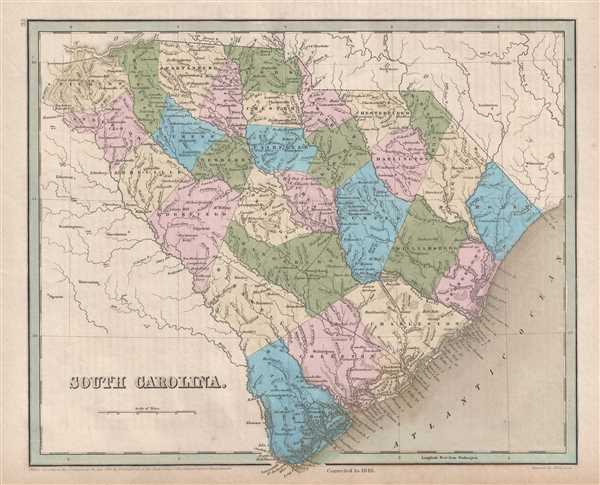 This is an 1846 Thomas G. Bradford map of South Carolina. The map depicts the region from Georgia to the Atlantic Ocean and from North Carolina to Savannah, Georgia. The route of the South Carolina Rail Road Company, between Charleston, Columbia, and Savannah, is illustrated. Founded in 1843, this company operated until 1894, when it was succeeded by the Southern Railway. Highly detailed, each county is labeled and shaded a different color for easy differentiation. Numerous cities and towns are labeled, including Charleston, Columbia, and Savannah. Myriad rivers and creeks are illustrated and labeled, along with the Santee Canal. This map was engraved by George Boynton and published in the 1846 edition of Bradford and Goodrich's A Universal Illustrated Atlas. Bradford, T. G. and Goodrich, S. G., A Universal Illustrated Atlas, exhibiting a Geographical, Statistical, and Historical view of the World, (Boston: Charles D. Strong) 1846. The Universal Illustrated Atlas is one of the great American atlases of the first half of the 19th century. The atlas was first published in 1838 under the imprint of Charles D. Strong. It replaced and superseded Bradford's earlier smaller format Illustrated Atlas, Geographical, Statistical, and Historical, of the United States and yhe Adjacent Countries. Numerous reissues of the Universal Illustrated Atlas followed until about 1847. Although there are minor variations between the editions, most contain about 50 maps, the majority of which focus on the United States. Bradford's atlases are significant for recording North America during the Republic of Texas Era. In later editions, particularly the 1846 edition, Bradford illustrates the boom in railroad construction, possibly with the idea that his maps would aid travelers in planning journeys by rail. It was compiled by Thomas Gamaliel Bradford and Samuel Griswold Goodrich with most of the plates engraved by G. W. Boynton. Other contributors include Thomas Gordon (1778 - 1848), Fielding Lucas Jr. (1781-1854), Samuel Edward Stiles (1844 - 1901), Sherman and Smith (fl. c. 1829 - 1855), and Horace Thayer (1811 - c. 1874).